The latest in offerings from Villa Lagoon Tile. 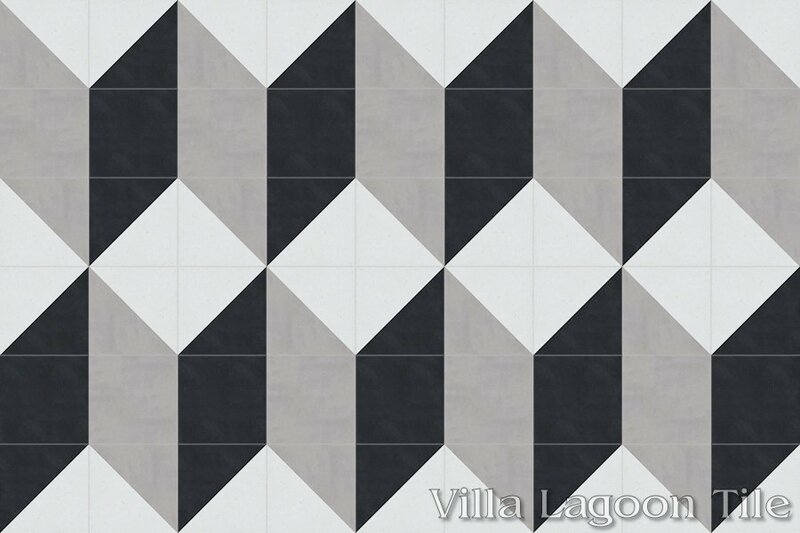 The romance of Italy is captured in our new shaped tile. 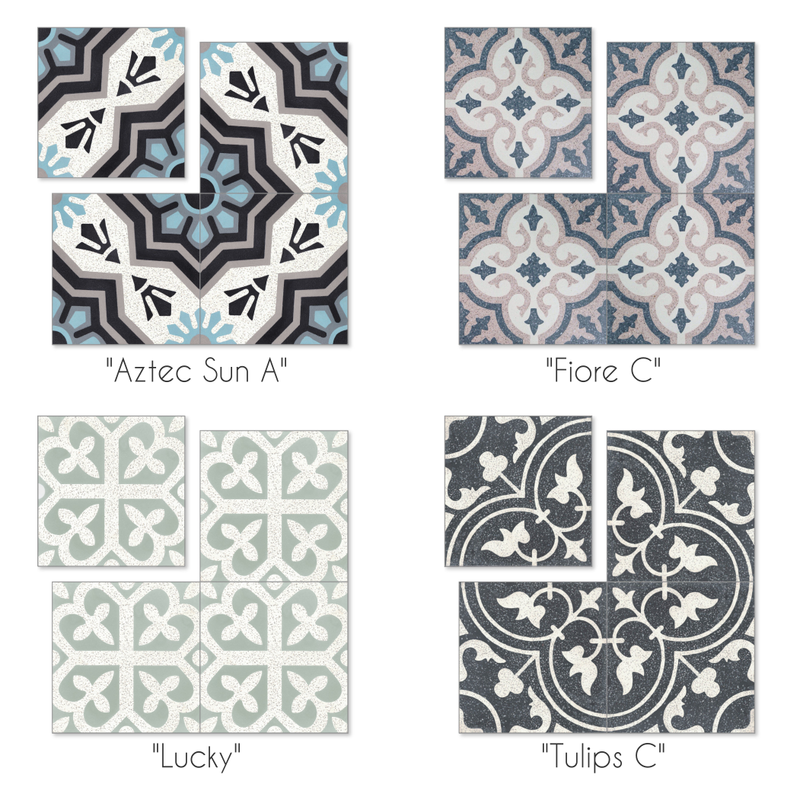 The color options are unlimited and cement tile has never looked better ! 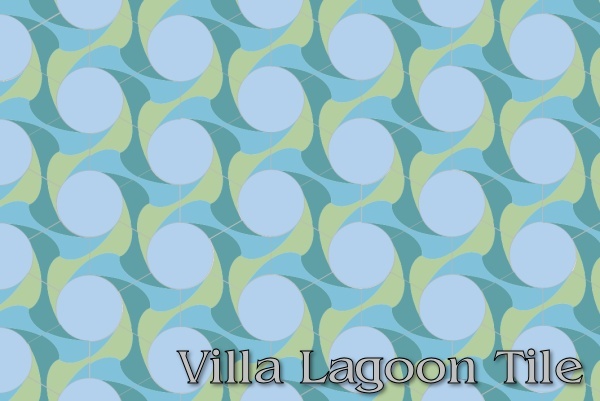 Villa Lagoon Tile’s “Florentine” shaped tile comes in two parts. 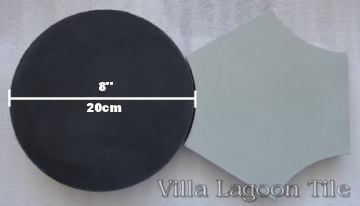 The larger piece is about 11 inches at the widest point and the smaller piece is 8 inches across. 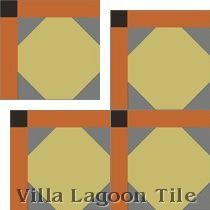 This tile can come in any thickness. The usual for interiors is 16mm (5/8″) but when thinner or thicker is needed, we can do it. 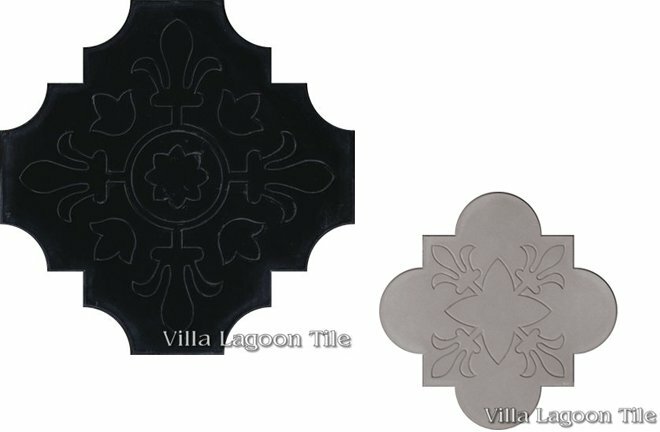 Our Florentine shaped tile has a slight Fleur-de-Lis relief pattern on each tile which improves traction. 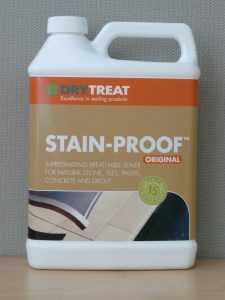 We are stocking it in Black and Featherstone Gray but imagine the possibilities of color combinations. 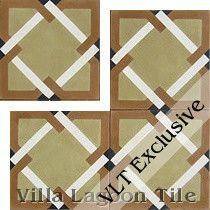 Our Stock Tile is ready to ship. We started with a Black & Gray combination because it fits so many needs. 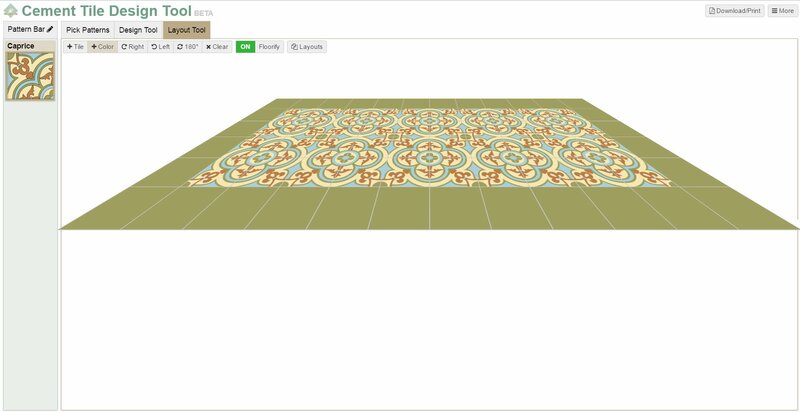 This would be a stunning wine cellar floor or the foyer in a Hollywood Hills Spanish revival home. 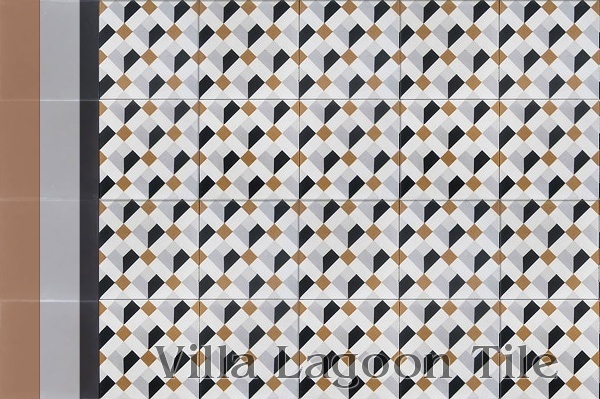 Just imagine a courtyard or restaurant paved in this stunning tile. 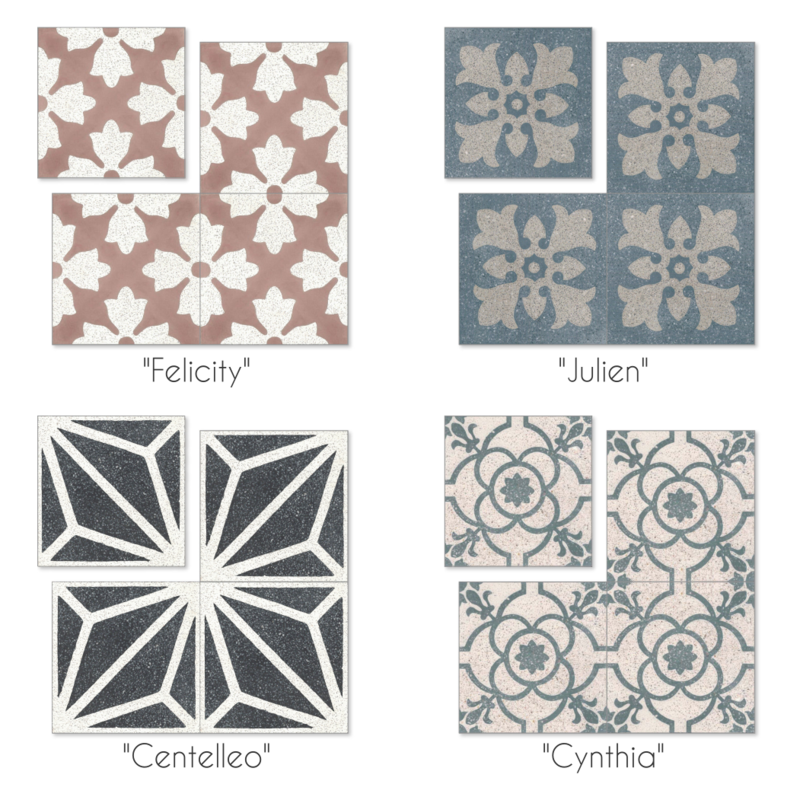 our South Beach cement tile colors. 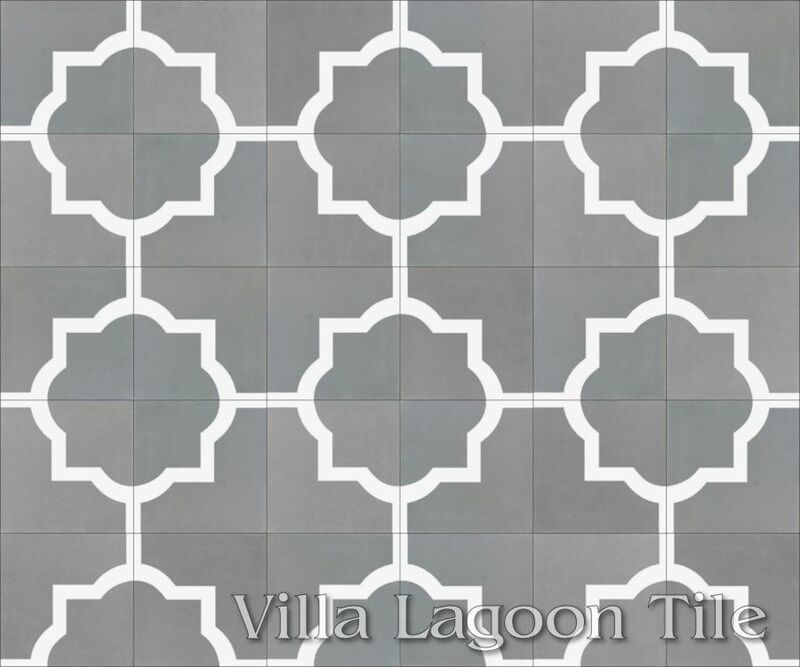 “Best of 2013” Design Award, a Cement Tile Win. 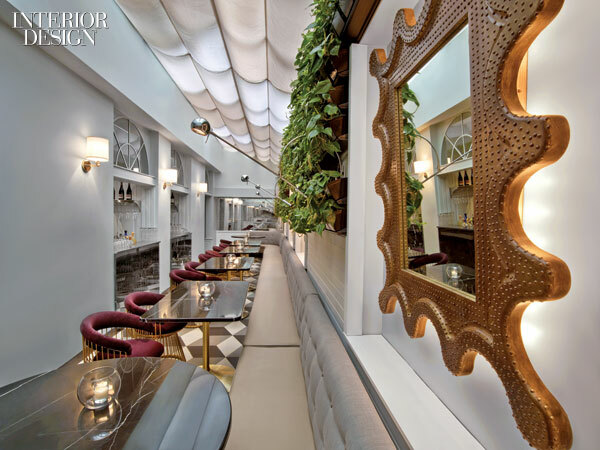 Interior Design magazine has chosen the “Best of the Year” for 2013, and we’d like to congratulate our client, Meyer Davis Studio for winning “Best of the Year 2013: Fine Dining“. 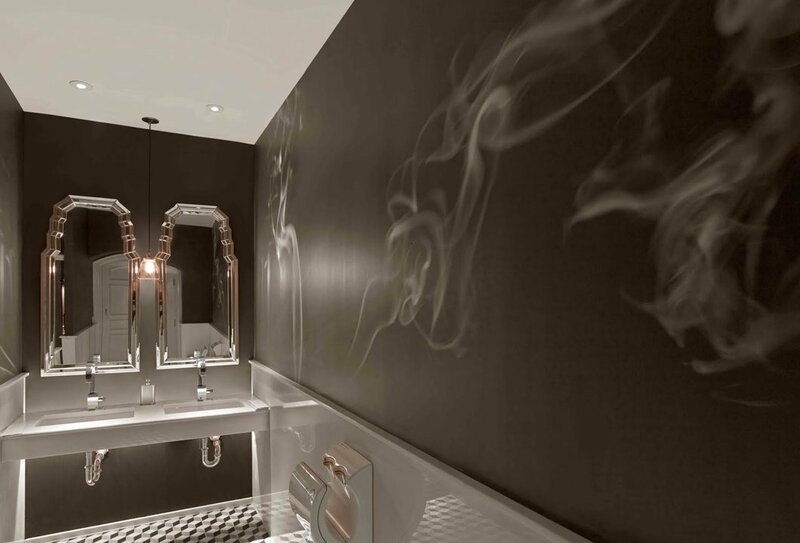 Their project “Harlow” remodeled a historic space once the private entertainment venue of William Randolph Hurst. 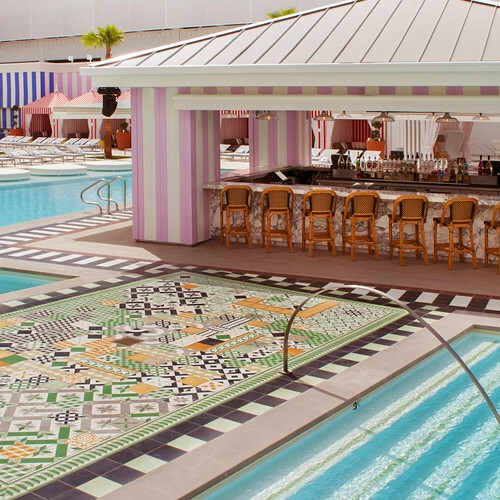 Perhaps as much a restoration as a renovation, the Harlow project brought the best of the 1930’s grandeur forward to the modern day. 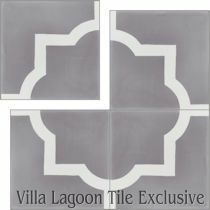 The award-winning design features some of Villa Lagoon Tile’s most popular designs in several places. 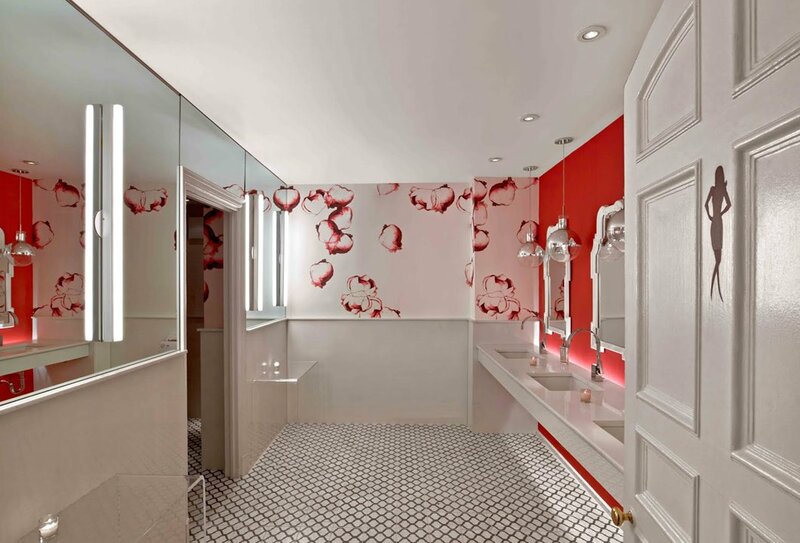 “Salamanca” and “Cubes” can be found in the elegant restrooms, as well as a larger version of Cubes in a conservatory dining annex, that gained a mention in Interior Design’s original project article, “Blond Ambition“. 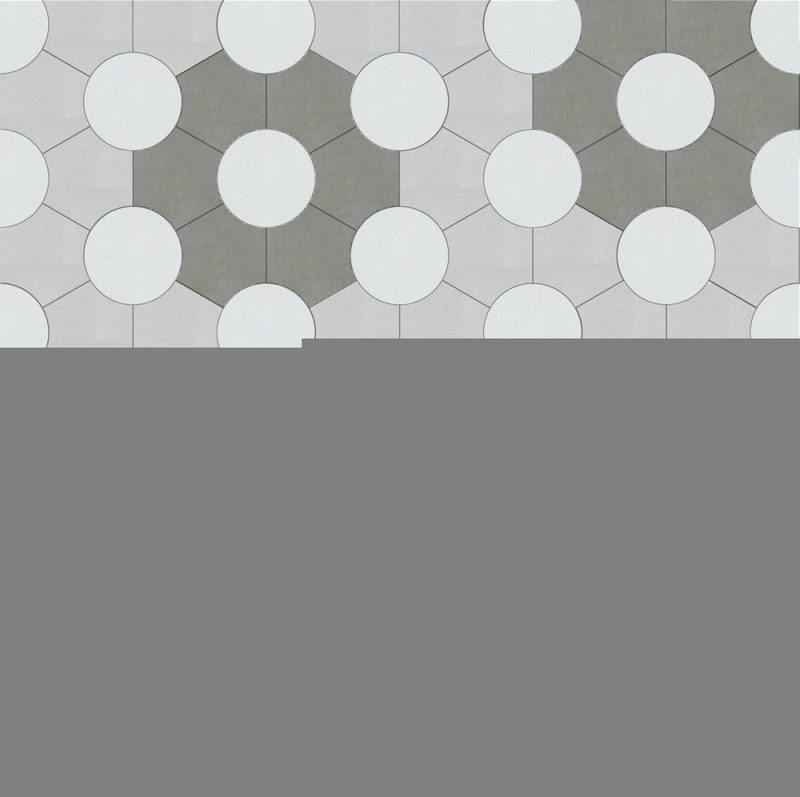 This installation in particular shows cement tile’s versatility, using solid and two-color tile to provide a larger scale of Cubes design. While our ever-popular “Cubes” cement tile was used in the stately-men’s room, a different feel was desired for this dining area. 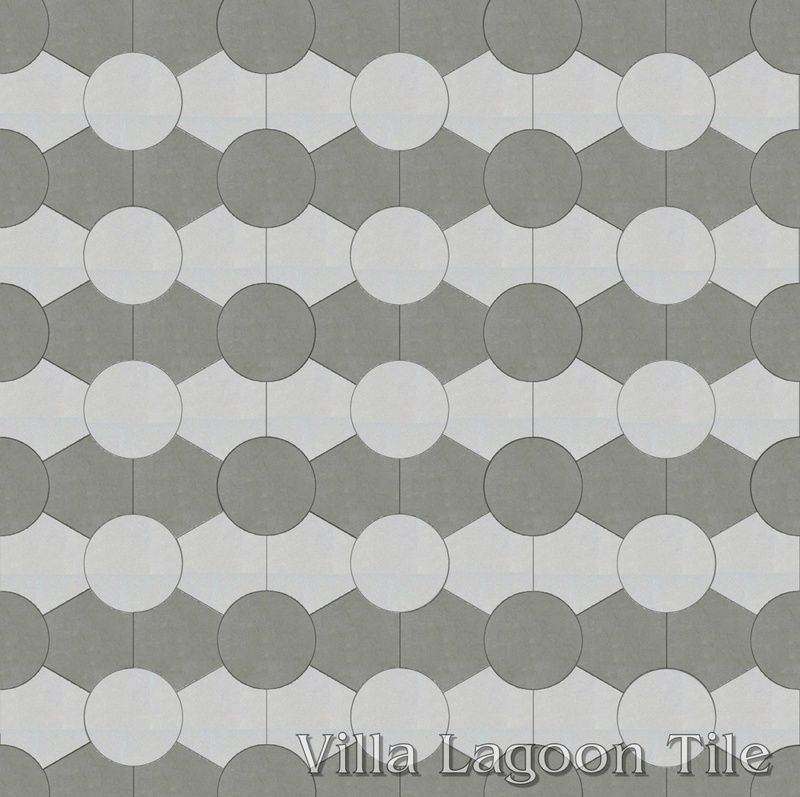 A larger patterned is achieved by the creative arrangement of the simplest tiles in our toolkit: solids, and the two-color diagonal. 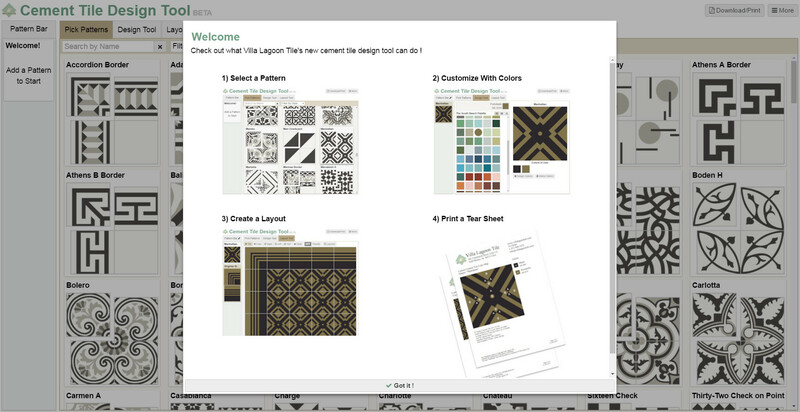 This layout also shows how easily a designer could use cement tile to create grand, custom chevron patterns. 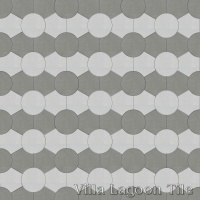 Large-Scale cubes using Monterey Collection “Diagonal” and single-color tiles. 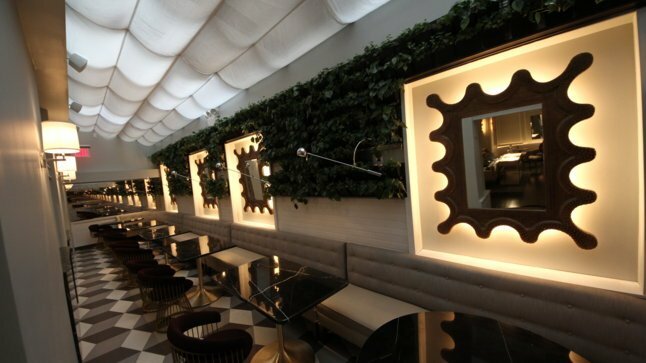 The writers of Interior Design are not the only ones taking a notice to the renewed luster of this Midtown Manhattan jewel… Harlow is quickly being recognized as a great experience, and has already been the venue for parties hosted by Madonna, Woody Allen, and others in the New York social scene. Update April 27, 2016: Unfortunately Harlow has closed. Their original site can still be found in the Internet Archive. 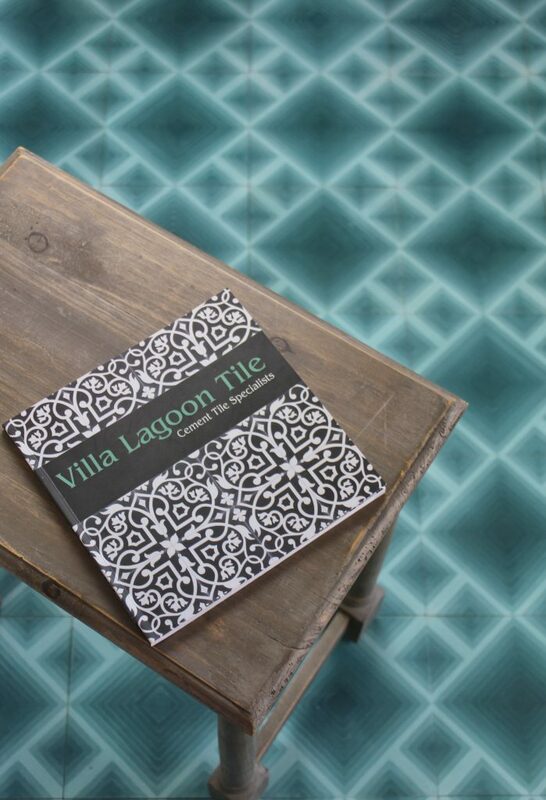 Villa Lagoon Tile is proud to present a new revolution in cement tile. 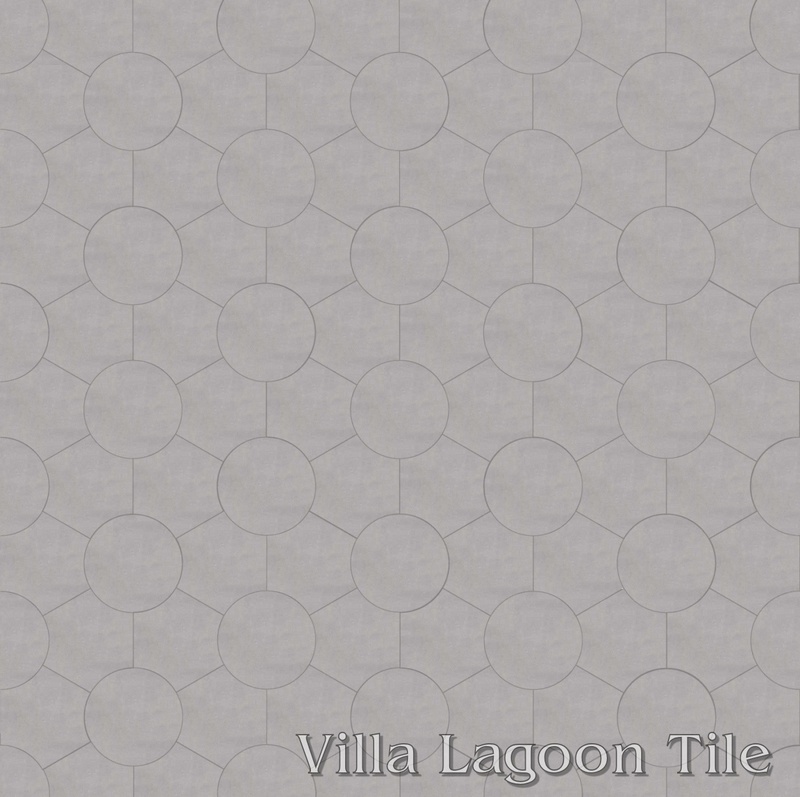 Roto Tile™ provides a whole new landscape for expression with circular tile. 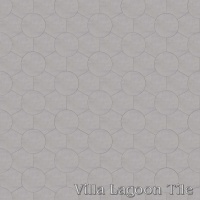 These 8″ circles are spaced by special connector tiles, and the whole layout simultaneously invokes circles, hexagons, and triangles of varying sizes. 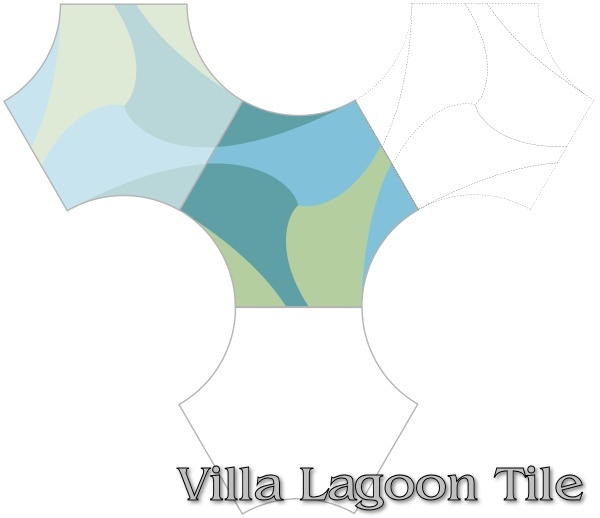 At Villa Lagoon Tile, we believe in giving designers and architects as much choice and freedom as possible. 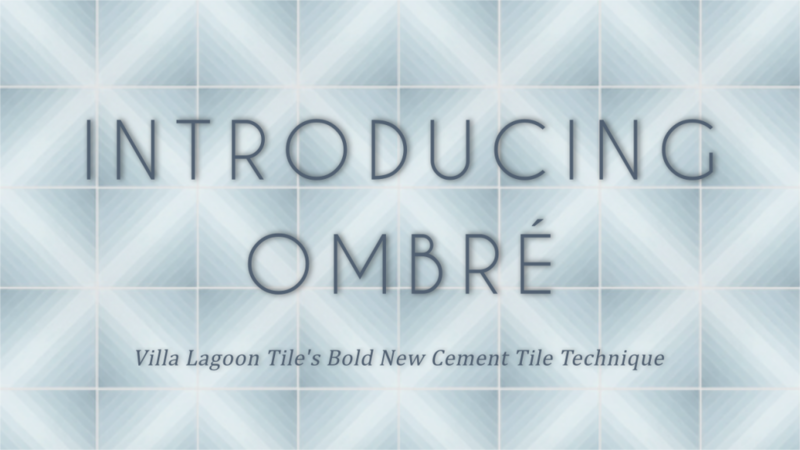 This has been one of the many strengths of cement tile. 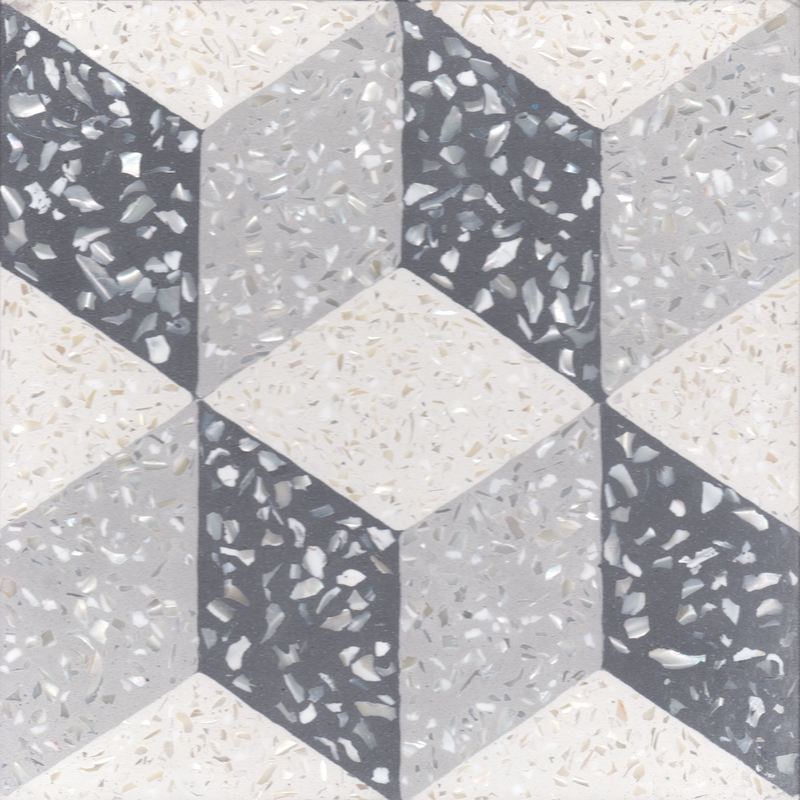 Our new Roto Tile™ pushes those boundaries just a little bit more. 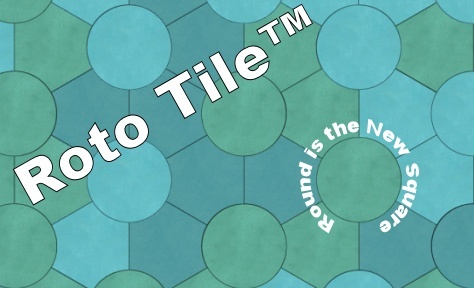 Roto Tile™ are laid with a ratio of one circle tile to two connector tiles. 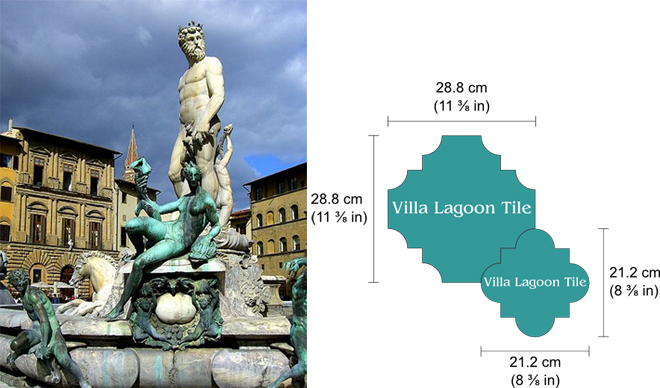 We have created an entire page dedicated to describing the dimensions of these circular tile here: Roto Tile™ Dimensions. 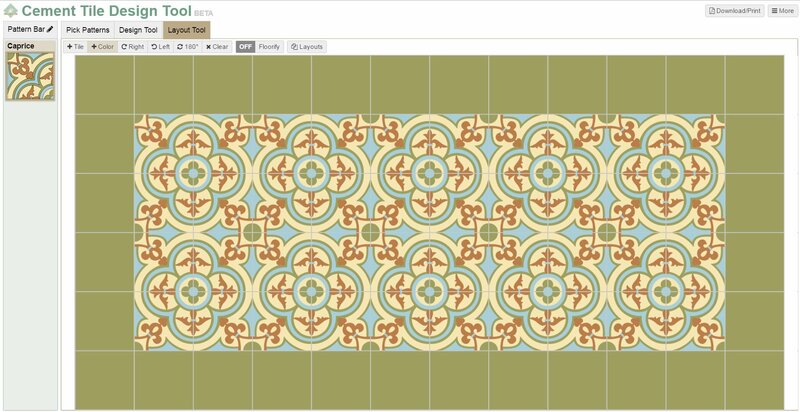 You can see more of these example layouts here: Roto Tile™ Example Layouts. 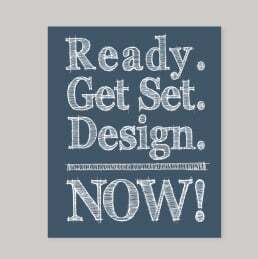 These are just a few examples to get you started. 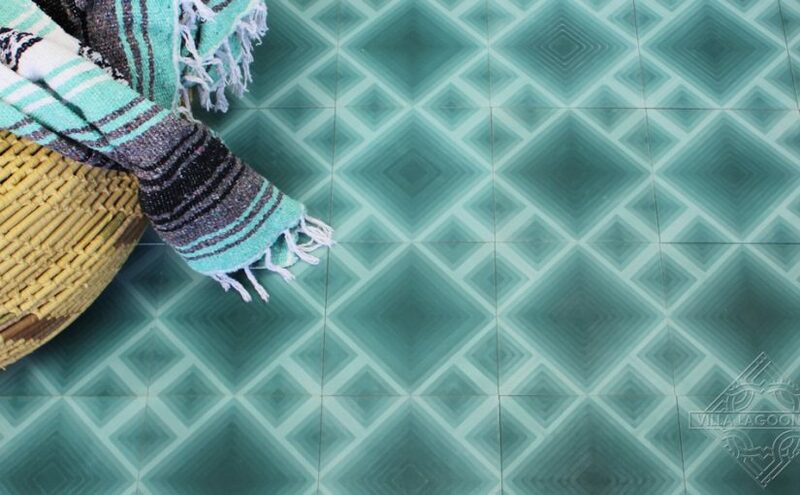 With more than 60 colors in our Monterey Palette, the possibilities with single-color tiles are endless. 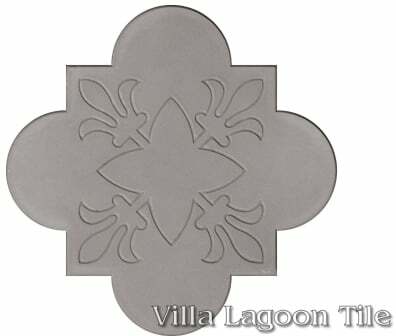 As with other cement tiles, these custom shapes can take colorway molds as well! 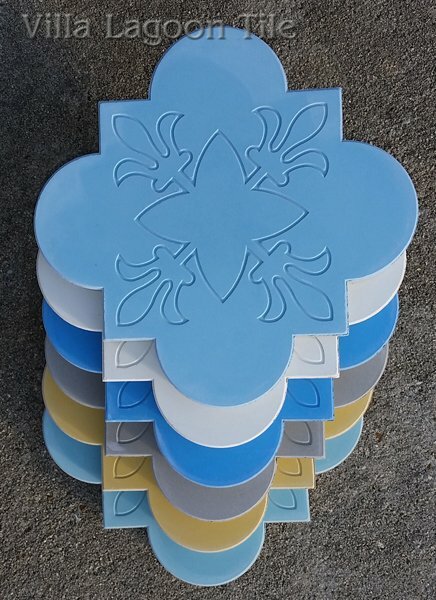 Colorway molds segment a tile, allowing tile-makers to pour a different color in each segment of the design. 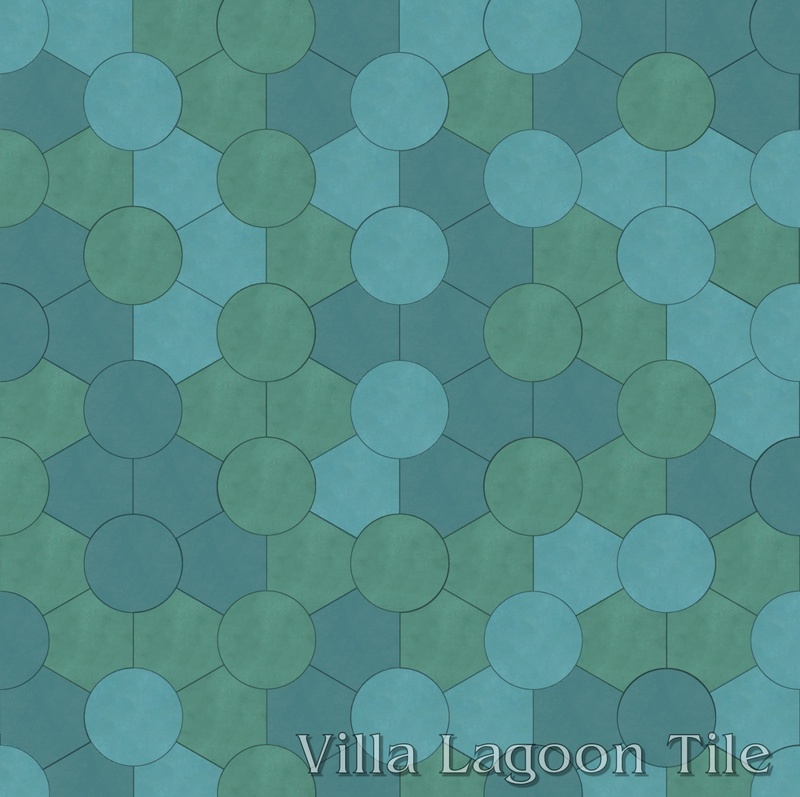 We’ve created the mock-up pattern “Ripples” to show the beginning of what can be achieved using a colorway mold in just the connector tile. 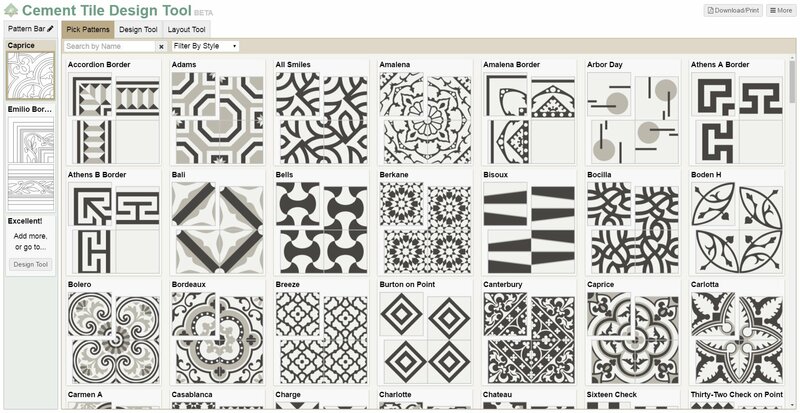 We are happy to add Roto Tile™ to your design arsenal, and look forward to helping you achieve your vision. 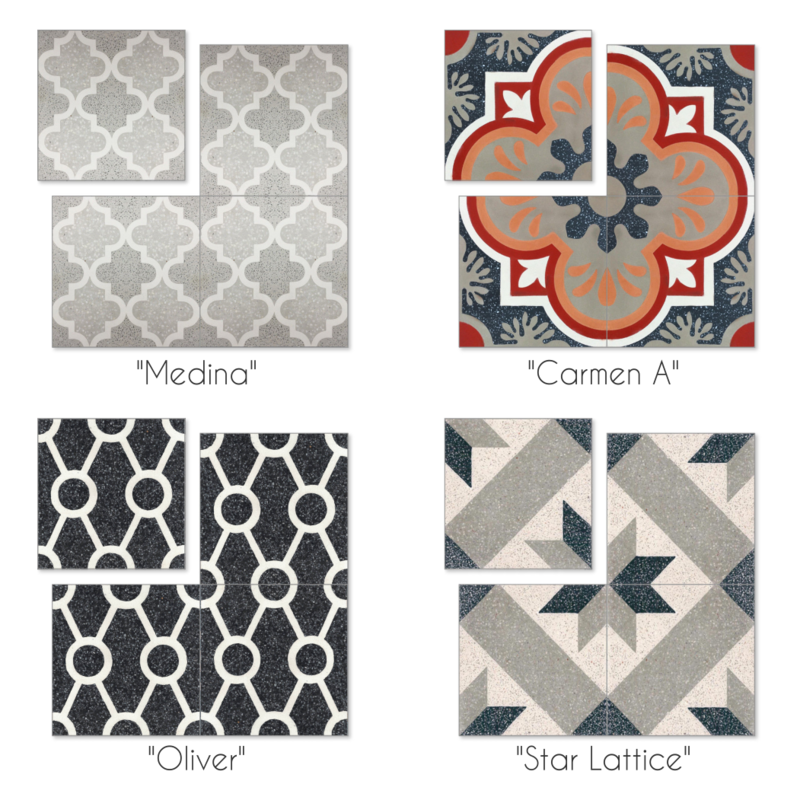 We now have sample Roto Tile™ available, as well as Monterey Palette color-chips. 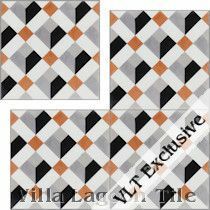 If you think our cement tile is right for your designs, call us at 1-251-968-3375 or email info@villalagoontile.com to discuss your project. 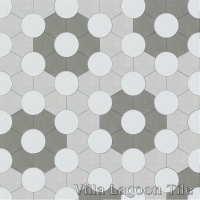 One of our new Venetian Collection tiles, Piazza, creates a pattern of linked barbed quatrefoils. 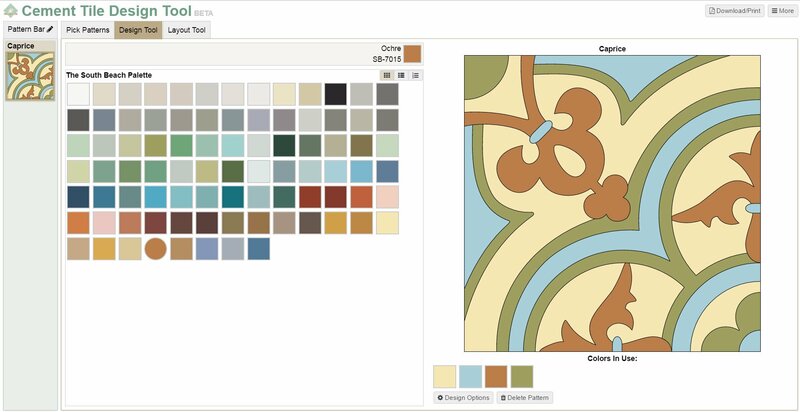 The quatrefoil, from the Latin quattuor and folium, “four leaves” became a common theme in Christian art, and reached it’s height in Gothic and Renaissance architecture. 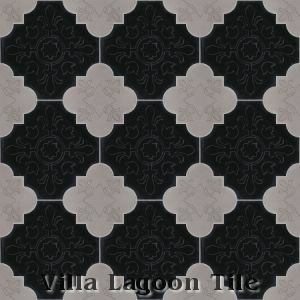 “Piazza”, from the Venetian Collection, In Oxford Gray and White. 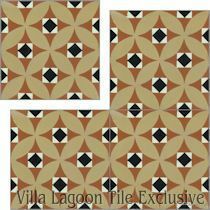 This pattern can be found throughout European architecture, including Notre-Dame de Paris, and the great abundance of of this pattern in Venice inspired Lundy to create this Villa Lagoon Tile exclusive cement tile. 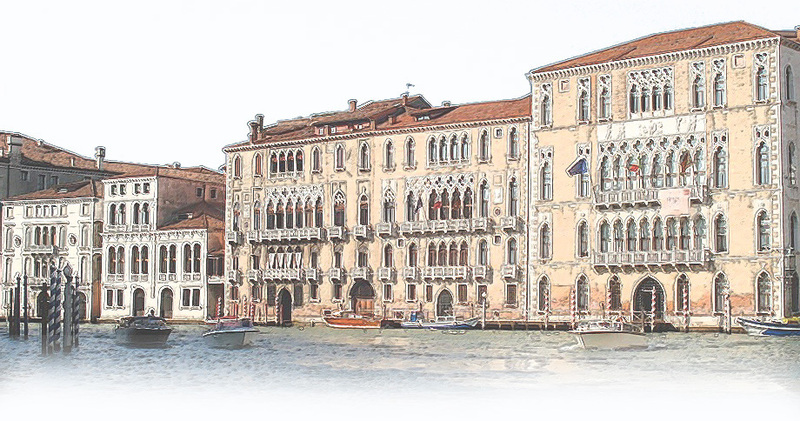 Katie, author of the blog Live Originally, found a stunning example on her honeymoon trip through Europe, in one of the courtyards of the Doge’s Palace in Venice. 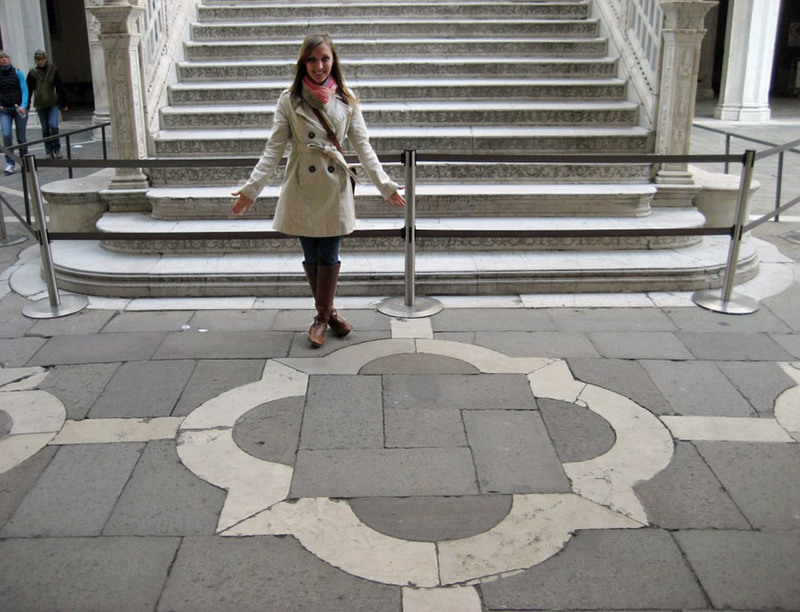 A stonework quatrefoil in Venice. 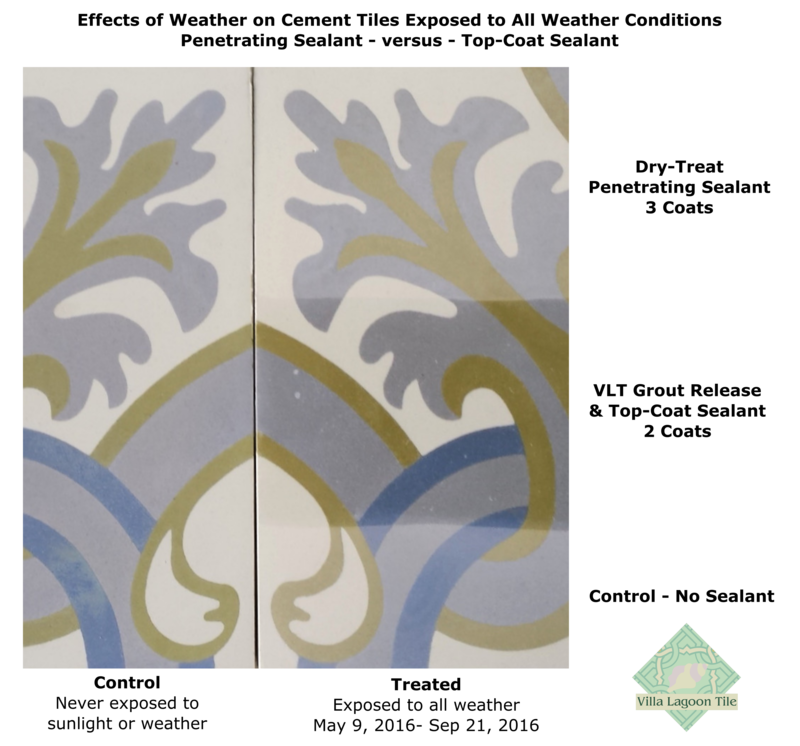 Update: As of October 2015, we have discontinued advertising the ceramic and porcelain tile murals on our website, in order to tighten our focus on cement tile. For purchase inquiries, please contact us, and ask for Dave. 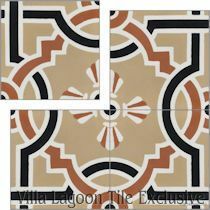 Of course Villa Lagoon Tile is home to artist, designer and cement tile expert Lundy Wilder, but we also keep our eye on the future. 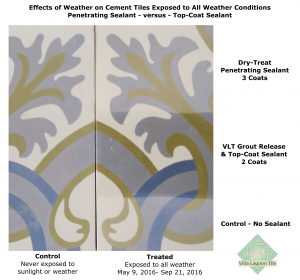 While we specialize in making it easy to bring the old-world charm and beauty of hand-made cement tile to your home or business, we love all beautiful tile, whether the techniques are old or new. 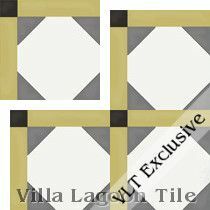 We are proud to announce our newest line of tile products: tile murals. 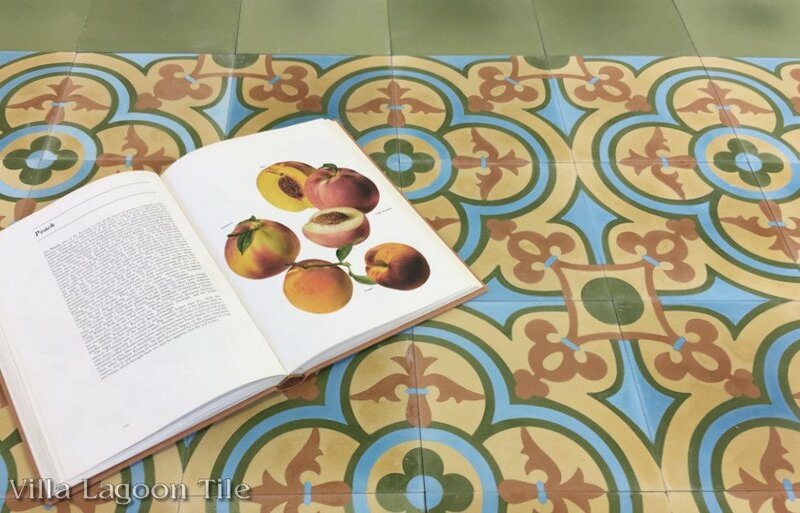 Thanks to advancements in materials and dye sublimation printing, we can produce beautiful and durable tile products with printed images… painting reproduction, photographs, digital art, you name it! 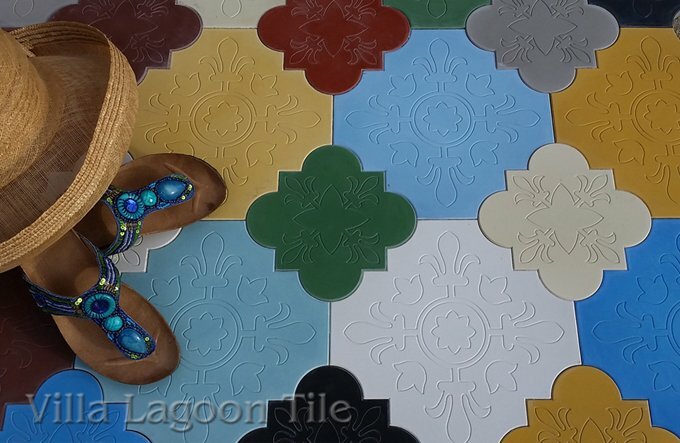 Break that image across a large grid of tiles, and now you have a beautiful tile mural, limited only by your installation space. 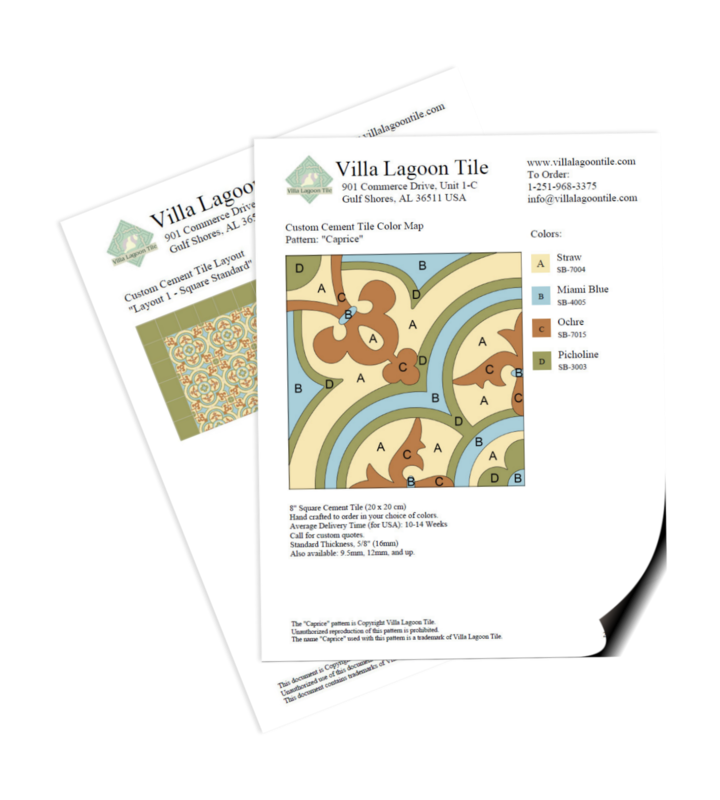 Villa Lagoon Tile partner Dave Perry has made it his mission to study these processes and source the finest in materials and techniques to beautify your projects. 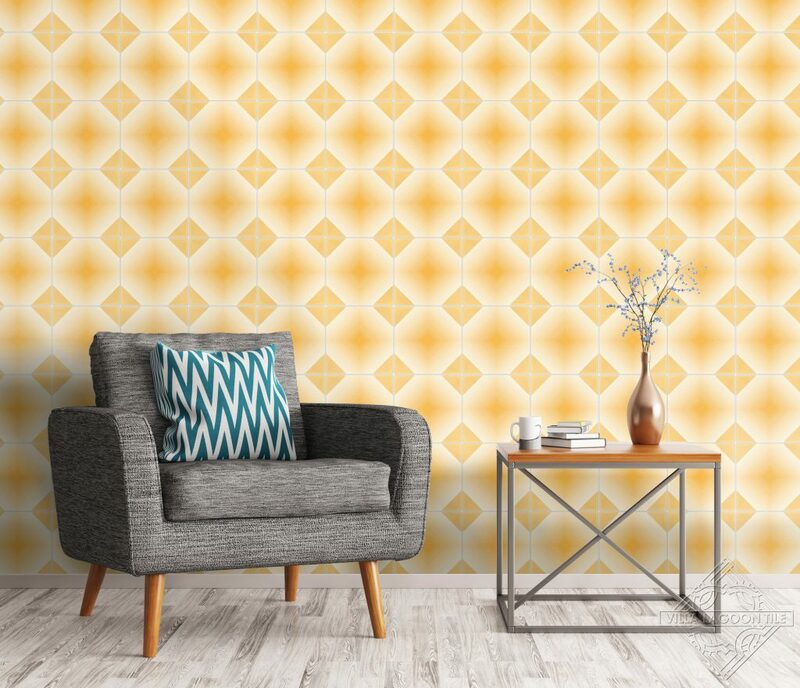 Our catalog of stock images for mural production is now available online, and debuts with more than 8,400 images. Ranging from classics like Van Gogh’s Starry Nights and Da Vinci’s Mona Lisa to modern marvels such as shuttle launches and Times Square, you’ll be amazed at the variety. Not enough for you? 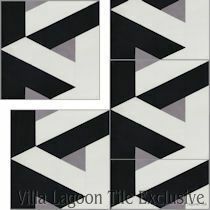 We can use your own photographs, logos and art for truly custom tile murals! Spread your company logo across the wall behind the reception desk, put images of your own restaurant’s menu items on an accent wall near the entrance, the possibilities are endless. 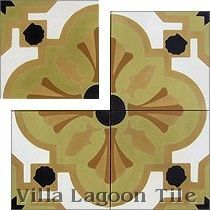 For questions, ordering or submitting your own work for custom murals, as always contact Villa Lagoon Tile, and ask for Dave.